Clearcuts near Protected Areas in Cape Breton (from the Harvest Plan Map Viewer). The latest announcement of Crown land harvests (Harvest Plan Map Viewer June 12, 2017): 2,320 hectares (188 parcels, 73% clearcuts, 27% partial cuts; comments close on July 2, 2018). 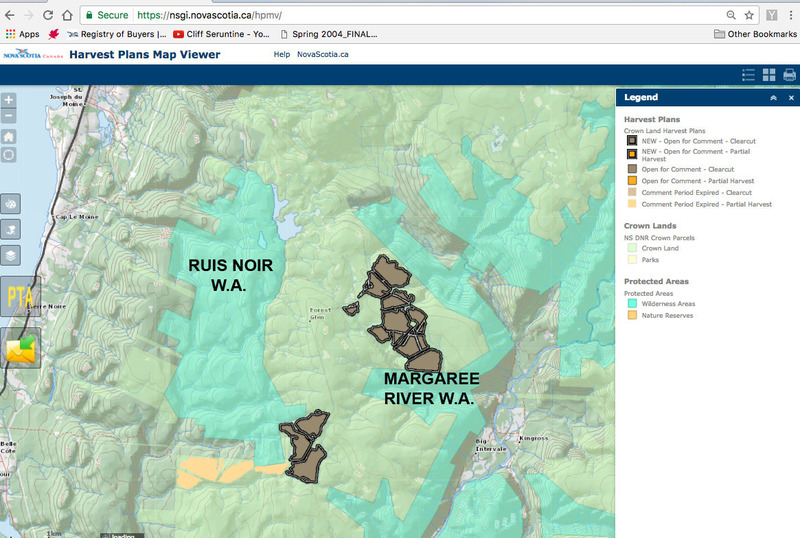 These include 343 ha of new clearcuts next to two Protected Areas in Cape Breton – the Margaree River Watershed Protected Area and the Ruiss Noir Protected Area. Perhaps the thinking is that if they cut close to Protected Areas, the Clearcut Refugees have a place nearby to go. This announcement followed by less than 2 weeks, the announced plan to cut 1,321 hectares (110 parcels, 74% clearcuts, 26 % partial cuts, announced June 2/comments close June 21, 2017). The next announcement is scheduled for June 22, 2017. As noted, the majority of these harvests are straight-forward (1-stage) clearcuts. Most of the “partial cuts” are likely 2-stage clearcuts or the equivalent with perhaps 1/5th selection cuts – you have to request the PTA for each block to find out. See What’s a clearcut and what’s not a clearcut in Nova Scotia? For the two sets of scheduled cuts, the total is 3641 ha. One ha (hectare) is 10,100 sq meters (think 100 x 100 m). For the area in acres, multiply hectares by 2.47 so the total in this case is 8993 acres. For reference, an international rugby union field is 1.008 ha; the pitch areas of baseball fields vary between 0.83 and 1.12 ha, averaging about a hectare; a Canadian football field (137 x 59 m) is 0.81 ha. So close to 4500 Canadian football fields are to be harvested, most by 1-stage or 2-stage clearcuts. And that’s just over the last 2 announcements, which come at 1-3 week intervals. It’s pretty grim, especially for the Clearcut Refugees. Not to mention lost carbon storage, impacts on aquatic habitat, nearby family camps and more. On a related note, the new Minister of Natural Resources has been announced; it’s Margaret Miller who was Minister of Environment in the last government. We are waiting for details of the Independent Review of Forestry. Rumour has it that the consultant has been identified and is from Ontario. As I said, rumour. Anyway, both confirmed and anticipated appointments could be good signs. In the meantime, clearcuts on Crown land continue unabated, apparently under the contracts in place. If there is any change coming, we won’t see any of it on Crown land for another 3-4 months at least, with 1000s of football field equivalents cut or identified for cutting on Crown land in the interim. One also has to wonder how much of what is being cut will even get processed, given uncertainty over softwood lumber, NAFTA etc. Thanks to S.A. for his Facebook post about the cuts in the Margaree. Thanks to M.L. for his Facebook posts about the latest announcements. This entry was posted in clearcuts, Climate Change, Conservation, NSDNR, Parks & Protected Areas. Bookmark the permalink.